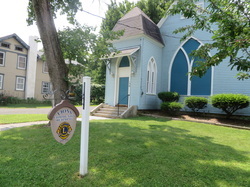 Community Hall, at one time the Presbyterian Church, is on the site of Boalsburg Academy, erected in 1853. A number of prominent men attended the academy before it was closed in 1880. The presbyterian congregation used the first floor for worship, while the Academy occupied the second. The high school was located in the former Academy rooms for several years before the early building was razed in 1892.